If there’s one thing people tell you about the island of Penang in Malaysia, it’s the food. 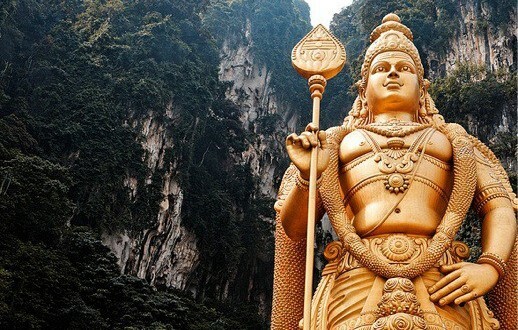 Never has an island been so famous for it’s cuisine, a mixture of Chinese, Indian and Malay, passed down through generations of immigrants, fused with each other in ways too tasty to describe. 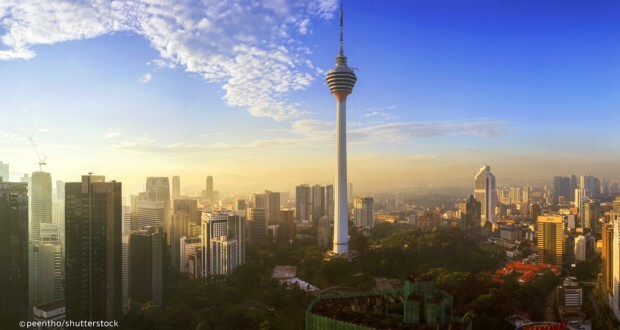 Of course there are many restaurants, cafes and hawker centres to get your Malaysian food fix but you can always do one better than that in Penang. We were invited to Tropical Spice Garden, not only a cooking school but, as the name suggests a beautiful haven of pretty gardens, ponds, woodlands and walks to explore, filled with lots of educational information about the spices found in Asia. 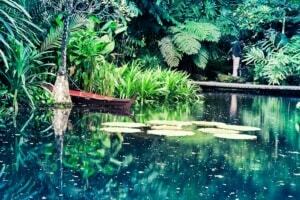 We were first met at reception of the Tropical Spice Garden and given a guided tour by our very knowledgable guide. It was a very interesting lesson in why spices are used in foods, the medicinal properties and the history of spice trading in Penang. Just the tour of the gardens alone is worth a visit as there’s lots to learn. Our tour ended at the cooking school building. 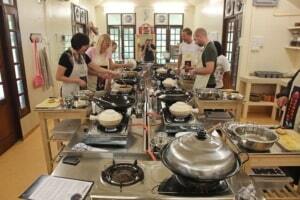 A perfectly clean and well organised environment for up to 20 people to cook. Our teacher and local celebrity Pearly Kee greeted us with a warm smile and a friendly chat as we donned our aprons. 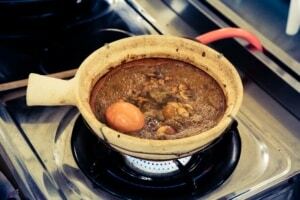 Today we were to prepare two dishes, both known as Nyonya food. The “Baba Nyonya” were 15th century Chinese immigrants who moved to Malaysia, bringing with them their culture, traditions and amazing food. In fact I’d have to say Nyonya food is by far my favourite in Malaysia. Pearly soon set us to work, preparing our vegetables and talking us through the recipe sheet we all had. Everything we needed was easily to hand, the work space was bright and clean and Pearly circulated the room helping each of us. We were cooking Nyonya Tau Ewe Bak, also known as “Dark Sauce Pork”. A thick syrup like sweet and tasty sauce, today we’d actually be replacing the pork with chicken but either work very well. 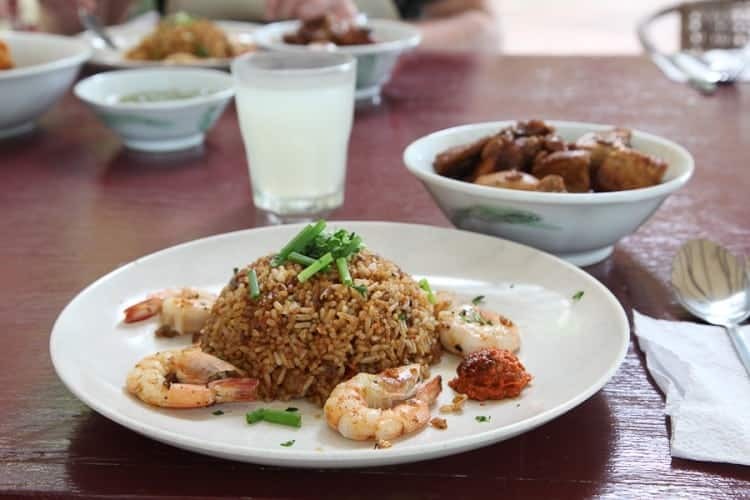 We’d also be creating Nyonya Fried Rice which includes large prawns, shallots, garlic and Sambal Belacan, a tasty chilli and shrimp paste used in a lot of Nyonya food. Our tour of the spice gardens gave me a new found perspective on the ingredients I was cooking with, understanding what they add to each dish. The fun part of Asian cuisine is always using the Wok. We each had a very large Wok on our gas hobs in front of us and mixing the ingredients, curry pastes and rice was entertaining. I also discovered the fine art of cooking at the right temperature. Too low and flavours don’t fuse together, too high and you can dry out your food too much, losing essential oils from the ingredients. Pearly had staff members constantly nearby to help clear up the mess we were all making, keeping our work areas very tidy and presentable. Usually when I’ve been in the kitchen it looks like somebody’s broken in to your house and thrown food around, so it was a treat to work in such clean surroundings! I could have listened for hours to Pearly Kee’s cooking tips, anecdotes of previous students and her favourite recipes. Our group of around 8 people had a great time and everybody’s meals looked delicious. We left the kitchen with our 2 plates each and sat at a table outside. Pearly had also prepared an amazing mango salad to go with our dishes and gave us homemade lemonade drinks to go with our meal. I have to say I was very pleased with my culinary efforts, mostly thanks to Pearly’s great instructions and one of the tastiest recipes you’ll ever eat. Also an enjoyable group to chat with over lunch and a great experience that’ll I’ll remember fondly. 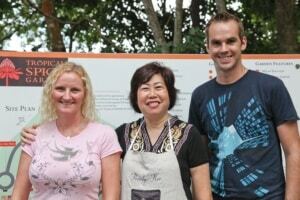 If you’re looking to experience the best of Penang’s food and do something a little different during your stay in Malaysia I can recommend the Tropical Spice Garden cooking school. 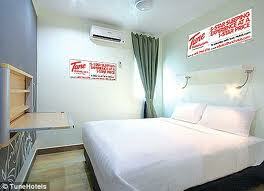 Address: Lone Crag Villa, Lot 595 Mukim 2, Jalan Teluk Bahang, 11100 Penang, Malaysia.